SENNEBOGEN 880 R-HD material handler. 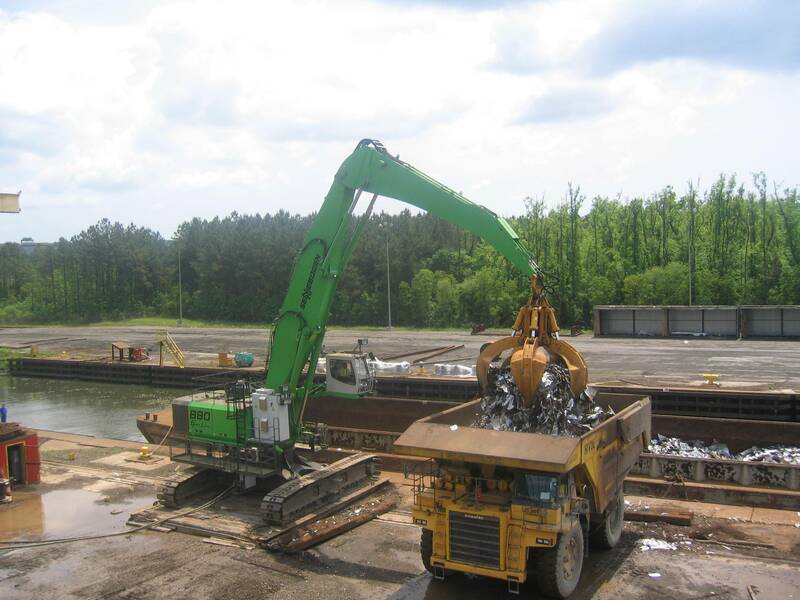 Sennebogen accelerates turnaround, reduces costs in Charleston port with supersized electric drive scrap handler. The port facility receiving scrap metals for the nearby steel mill is now unloading barges and filling haul trucks 25% faster with its SENNEBOGEN 880 R-HD material handler. After commissioning a new 370,000 lb. SENNEBOGEN scrap handler at the Kinder Morgan Energy Partners barge facility in the Port of Charleston; the truck fleet use was reduced by 25% while still keeping pace with customers’ demand for material. Constantino Lannes, President of SENNEBOGEN LLC, welcomed Wall’s interest in the project. “It took a leap of faith for Kinder Morgan to step up to the 880 R-HD,” he says, “but their application here and their experience with our equipment made them the ideal partner. SENNEBOGEN led the adoption of electric drive material handlers in America. No one had produced an electrically powered unit as large as this, so we needed a test bed to prove the engineering. The 880 R-HD would be a prototype, and it would take time to build and refine the new machine. “We knew we were the guinea pigs. We didn’t know if it would work, but we wanted to try because of the future savings which, with the way fuel costs have gone up, turned out to be a pretty good decision,” said Wall. Since the new machine went into operation, diesel deliveries are down more that 20%, saving the facility significant costs on a monthly basis. The crawler-mounted material handler simplifies the unloading operation further by being able to traverse the length of the dock under its own power. A powered tether line allows the machine a 400 ft. range of movement to position itself for unloading either of two barges at the dock. With this mobility, there’s no need to winch the barges into place under the crane.